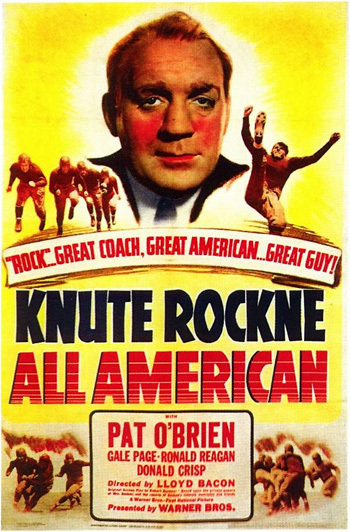 Knute Rockne: All American (1940) is the inspirational film biography of the famous and prominent Notre Dame football coach, Knute 'Rock' Rockne (Pat O'Brien). The immortalized coach is brought to life in this excellent, episodic film characterization directed by Lloyd Bacon - it portrays his sportsmanship, emphasis on teamwork, his determination to win, and his wholesome influence on the many young men who played on his squads. An original screenplay by Robert Buckner was based upon the private papers of Mrs. Rockne and the University of Notre Dame. As a tribute to some of Rockne's colleagues, four of his contemporaries (including grid coaches and friends) appear briefly in one sequence: Howard Jones, Glenn 'Pop' Warner, Alonzo Stagg, and William 'Bill' Spaulding. The sports film is peppered with actual newsreel clips of actual games (mostly between traditional rivals Army and Notre Dame). Some day, when things are tough, maybe you can ask the boys to go in there and win just one for the Gipper.